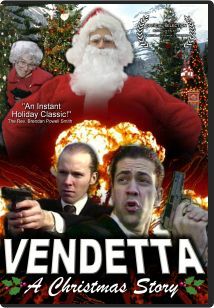 Vendetta is available on DVD! That's right: for the first time ever, you and your kin can own both episodes of Vendetta in all their pristine glory, digitally remastered for DVD by the creators. See every detail. Hear every detail, from the subtle falling of snow to the deafening roar of gunfire. No longer do you have to crowd the whole family around a computer screen: gather in the comfort of your living room and watch it on the tv. 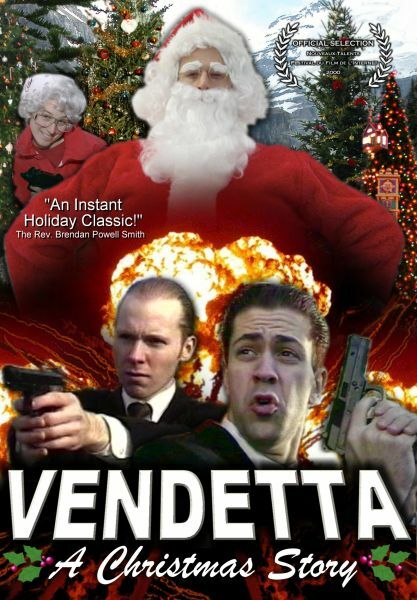 This is Vendetta as it was meant to be. How much would you pay? One thousand dollars? One million dollars? Of course you would. But there's more! It also features the rare "Pilot" episode, and a previously unreleased brief: "In the Editing Room with Jonathan Field". Get an envelope big enough for a DVD (a 6" by 9" should do it). Write your complete address on the back of this envelope. US residents put at least $1.10 in postage on it (Three normal stamps will cover this). If all that sounds like too much work, remember you can always enjoy it online.